Bamboo charcoal is also known as "Black Diamond" in many Asian nations. It is made from environmentally sustainable harvested bamboo and is burned in an oven to create charcoal. 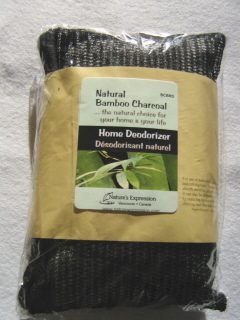 Because Bamboo charcoal has a naturally porous microstructure and a highly absorptive capacity, it is a natural deodorizer. Bamboo charcoal is naturally mineral rich and emits negative ions making it an incredibly versatile product. Bamboo Charcoal naturally absorbs food odours in the fridge for up to 4 months. Bamboo Charcoal produces natural "anions" that will help keep your food fresher longer. Simply place the small bag of Bamboo Charcoal in your fridge to enjoy long lasting natural freshness! You can also place this Home Deodorizer in your room to keep your home smelling clean and fresh. For up to four months!